In the TV show 7 Days, that was the limit to how far they could travel back in time. Sam Beckett was limited to the span of his own lifetime in Quantum Leap. However, the time travel system developed by Helen Phillips’ fellow scientist husband only goes back 36 hours. That means she cannot go back and prevent his murder, but maybe she can stop herself from becoming a murderer herself in Diego Hallivis’s Curvature (trailer here), which opens this Friday in New York. Phillips has been a basket case since the suicide of her husband Wells, but she suddenly snaps out of her funk when she gets a mystery call warning her to get out of the house. It is sort of like the opening scene to The Matrix, but the voice sounds weirdly like her rather than Laurence Fishburne. When she connects with her platonic work pal, Alex, Phillips learns she has lost a week of time. Soon thereafter, she comes to suspect the time machine Wells developed with his partner at Curvature Corp. really works—and the mysterious blue hoodie woman is actually herself, gone back thirty-six hours. When she discovers the truth about Wells’ murder, which we can guess the second our prime suspect enters the frame, she realizes why she went back. Can she stop herself from going to a very dark place, when she happens to be herself? 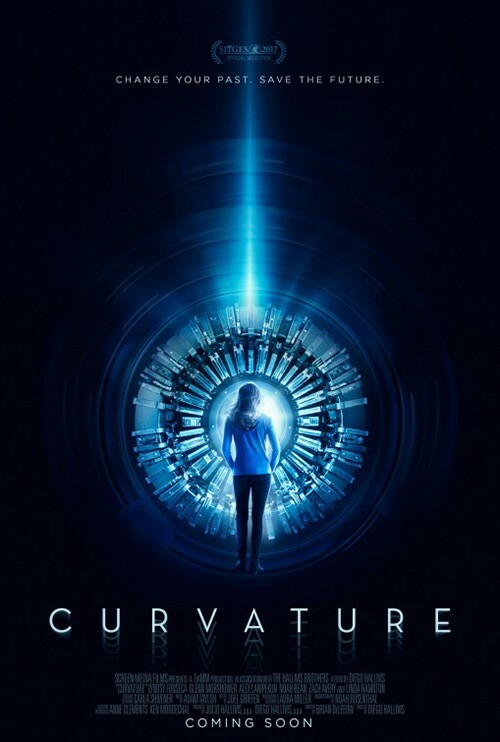 Curvature is an okay time travel film, but it is way too predictable. Honestly, one of the innumerable drawbacks to filmmakers’ biases against businessmen and venture capitalists is that it makes it stupidly simple to deduce the real villain’s identity. Curvature is a clear-cut example of that phenomenon. On the plus, side the time travel stuff is pretty decent. Wisely, Hallivis does not try to do too much with respect to near-misses and crossed paths for Phillips and Phillips-prime. Instead, he focuses on Phillips’ intellectual and emotional challenges. A bit where she and good old Alex use their shared history to figure out a password is especially well-written, by Brian DeLeeuw. Lyndsy Fonseca and Zach Avery also turn it quite nicely, even they are often a bit stiff together. Sadly, the great Linda Hamilton had to be released early, so we only get a few tantalizing scenes of her playing Phillips’ mentor. However, it is fun to see been-in-everything character actor Glenn Moorshower turn up again as Wells’ partner, Tomas. Curvature has its merits, but it is also saddled by its budget constraints and blind spots. It is the sort of independent science fiction we want to champion, but this is definitely a case where the sum of its parts is greater than its whole. Just kind of okay, Curvature opens this Friday (2/23) in New York, at the Cinema Village.